Interested in playing Ankeny Football? Monday, April 22nd at B&B Theaters. The documentary is about the history of Ankeny Football. You can register for this event by using the link below. The cost is $10 and all Ankeny Hawk Football families should use the Hawk link. The boys will be receiving free tickets at school that will be available the week after spring break. The tickets have a code on them in which you or they can use to register on the website. So please keep in mind that if you are buying tickets for your family, you do not need to buy them for your player. But they will need to register on the site once they have the code. The site goes live tomorrow. Please note that the Hawk viewing will be for Ankeny Hawk football players, coaches, families, and other school administrators and faculty involved with our program. The showing will be approximately one hour long. When the viewing is done, the film will go to the Iowa Hall of Pride to be on display to all visitors. Ankeny 8th grade head football coach Don Griffin, the coaching staff, members of the varsity football team, and volunteers will be offering a summer long camp to players going into 6th, 7th, and 8th grades. The camp will be focusing on fundamental football techniques with a variety of skills and drill for the individual position. The AHS football staff would like to invite you to our 1st Annual Summer Youth Offensive Line Academy. Athletes will receive individual instruction on the basic fundamentals and techniques of offensive line play. Varsity AHS head football coach and college offensive line coach for over 30 years, Rick Nelson, will be the lead instructor. All campers will receive a T shirt. Please wear shorts, T shirt, cleats and bring a water bottle. Come and learn quarterback and wide receiver play with the Ankeny High School football staff, former players and guest coaches from the area. Each day will include throwing and catching competitions, games, and a whole lot of FUN! Campers will receive a t-shirt. The AHS football staff would like to invite you to our annual summer Youth Football Camp. Campers will receive individual and small group instruction by the techniques and fundamentals that will improve each player’s performance. The AHS Youth Football Camp will also include: games, competitions, and a whole lot of FUN! All campers will receive a t-shirt. Please wear shorts, t-shirt and cleats if you have them. The AHS football staff would like to invite you to our annual summer Football Camp. Campers will receive individual and small group instruction by the AHS football staff. Emphasis will be on individual techniques and fundamentals that will improve each player’s performance and prepare the team for the upcoming season. We will also begin installing both offensive and defensive schemes during this time. All campers will receive a t-shirt. Please wear shorts, t shirt and cleats. The AHS football staff would like to invite you to our annual summer Football Camp. Campers will receive individual and small group instruction by the AHS football staff. Emphasis will be on individual techniques and fundamentals that will improve each player’s performance and prepare the team for the upcoming season. All campers will receive a t-shirt. Please wear shorts, t shirt and cleats. 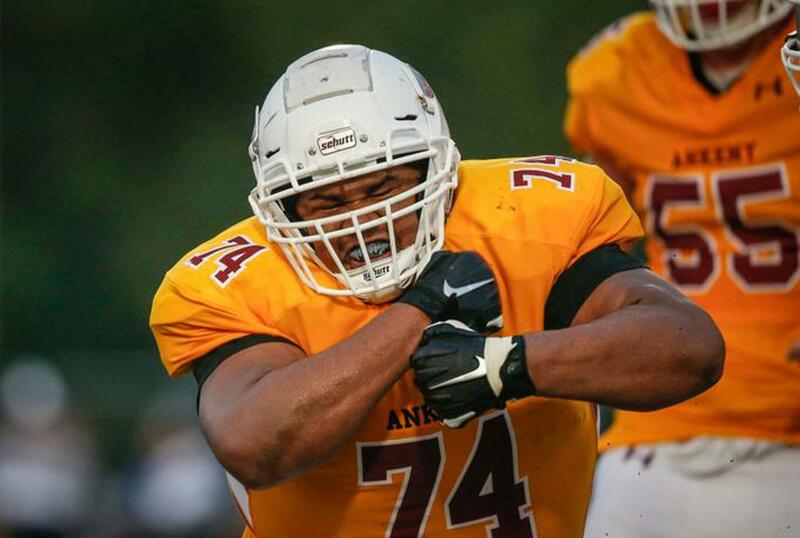 The mission of our Ankeny football program is to build character in our student‐athletes, continuously pursue excellence, and overcome adversity. The football field is our classroom and the game is our vehicle to teach lifelong lessons, create memorable experiences, and have fun. Effort, attitude, respect, discipline, character, loyalty, and sacrifice will be used to build a successful program. Our plan is to expose student‐athletes to a family atmosphere that will build on tradition and continue through generations of players. We will always prepare, practice, and compete to win on the field, in the classroom, and the game of life.